On April 23-24, Joint EU/UNDP Project "Community Based Approach to Local Dvelopment" (CBA) in partnership with local, rayon and regional authorities and with a support of regional press clubs held First Media Day in Lviv on Sustainable Local Development and Energy Efficiency for the media in Western Ukraine. Media event lasted two days, included media training, and section "Community Success Stories", followed by a press tour and communication with all its characters. First Media Day of CBA Project attended media representatives from three cluster areas - Lviv, Ivano-Frankivsk and Zakarpattia. These oblasts participated in "special piloting" of energy efficient component (along with three others in the east of Ukraine - Kharkiv, Zaporizhia and Dnipropetrovsk) and presented the updated regional strategy for energy efficiency. Lviv was selected for Media Day as oblast purchased a mobile laboratory for energy audit. 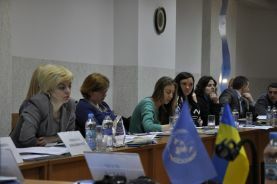 During the first Media Day in Lviv media representatives learned about all parties involved in the implementation of joint local initiatives aimed to improve people's lives. They are community representatives, local, rayon and and regional authorities, head of press relation service of the oblast councils and oblast state administration, and community leaders, and media partners of CBA. During the Media Day it was stressed on the importance of media role in dissemination of CBA positive experiences, successful communities' development, role of local leaders to raise public awareness. Media day consisted of different sections, such as Presentation of Project achievements; CBA cooperation with the government and press relation services and media; Success story. The first block of the Media Day CBA regional coordinators Ihor Nazar, Lviv oblast, Lesia Popeliukh, Ivano-Frankivska oblast, Liubov Pavlovych, Zakarpatska oblast presented successful implementation of energy efficient component in their oblasts. Uliana Flyshko, head of press relation service of Lviv oblast council talked about the role of press relation services and their cooperation with the Project. Representative of Kosivsky rayon state administration Mykola Nykyforyak stressed on the importance of cooperation between rayon authorities with communities and Media. 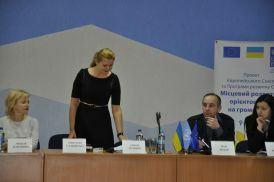 He presented best practices of energy efficient microproject implementation in Ivano-Frankivsk oblast. CBA Partners from media – journalists Halyna Yartseva (Uzhgorod) and Roman Mykytiuk (Lviv) – shared their experience of cooperation with the project in regard of energy efficient microprojects. In a separate section “Success Stories” Vitaliy Kimak, focal point of CBA Project in Sambirsky rayon and the head of community organization “Development Agency of Lukivska village council” Olha Voznina presented experience Luky village community, Sambirsky rayon. There in a local school 2 energy efficient microprojects were implemented thanks to joint efforts (on the next day journalists had an opportunity to see the results of the implementation during an exposure visit). 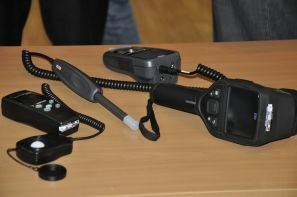 During this section experts presented newly procured equipment for Lviv mobile laboratory for energy audit. During the Media Day a special Media Training on ways and approaches how to cover the topic of social and economic development, energy efficiency and community based approach to local development in media. The head of Lviv press-club Roman Shostak taught journalists what genres to use while covering success stories of communities. The trainer also analyzed publications in local development whether they stick to journalistic standards. The main aim of CBA Media Days is formation of project media hub and setting up of “informational channel” with Media to disseminate best practices of sustainable development and project’s methodology.